Did you see the fight? Maybe that question is a bit redundant. Everybody saw the fight, if, that is “fight” is the correct description of what took place in Las Vegas yesterday. When the quicker of two men is moving backwards forcing the slower of the 2 to try and catch him before there is even the possibility of a fight breaking out, well, that’s more of a marathon. Am I knocking Floyd Mayweather? Quite the opposite I can assure you. One thing that boxing fans always seem to forget is the fact that boxing is a sport that relies on the scorecards. You’ve heard of the “10 point must system”, right? In any given round of boxing the judges are to award 10 points to the winner of the round and 9 points to the loser. At the end of the match the person with the most points wins, it’s just that simple. Exciting knockouts and toe-to-toe action simply are not a requirement of the sport; they are however a requirement if the fans are to get their money’s worth. That is where the problem in Sunday’s fight began in my opinion. Mayweather simply out boxed Pacquiao, period. Or maybe outran him is a better description. He threw and landed more punches than Pacquiao and that is all he needed to do to win on the scorecards. I was amazed at how many people didn’t agree with the decision of the judges. Floyd landed 34% of his punches, Pacquiao only 19%. Numbers don’t lie even if promoters do. The truth is my friends that this fight never had the chance to be the battle that it was hyped to be. Manny is one of the most respected and beloved fighters in history and rightly so. Floyd may not be as well liked (subjective) but his superior skills are undeniable. Manny simply could not stop him from moving around the ring and as a result he could not hit him. It’s hard to fight a ghost. My personal opinion is that this would have been a completely different fight 10 years ago. That’s when Pacquiao was faster, more aggressive and dare I say, younger. That is the fight that we all deserved to see but instead we have settled upon the show (or lack thereof) that we witnessed on Sunday. Keep in mind that Pacquiao had lost 3 of his last 5 fights before stepping in the ring with Mayweather. That is not the fighter that rose to fame and captured title belts in 8 different weight divisions. We are now seeing the remnants, the shadow of a once great champion. There is no one left for Manny to fight. Certainly the big payday that he had on Sunday will never come again and now the time has come for him to think about his health. 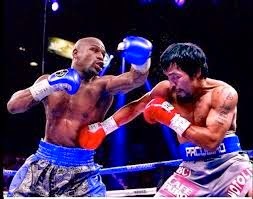 If Mayweather had been a devastating knock out artist Pacquiao may have had a much worse night than he did. It’s time for a change for this great fighter and, to be honest, me too. When I shell out $100 bucks for PPV I want to see a fight, not an exercise in frustration.